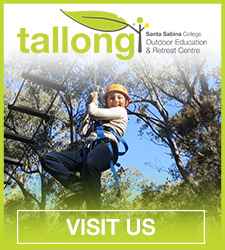 You are welcome to enjoy a school day at Santa Sabina. Meet the Principal Dr Maree Herrett and members of the College Executive and Leadership team. Take a tour through the classrooms, facilities and grounds led by the students and teachers. If these tour dates are not convenient for you please contact the College Registrar on +61 2 9745 7030 or email: enrolment@ssc.nsw.edu.au to arrange an individual tour of the College. My family and I were so impressed with the twilight information evening. Charlie, who met us at the gate and directed us to the auditorium was polite, warm and engaging. The information provided in the seminar about the five core values of Santa Sabina and Dominican philosophy was aligned with my own family values and ones I would wish my children’s school to build upon. Our tour guides, the teacher along with two students, were fun, engaging and clearly so proud to be members of the Santa community. The format for the whole evening was very personalised, informative and the information given was concise and answered all my questions.